September 16, 2010 - Boeing has continually protested over "launch aid" and other forms of government aid to Airbus, while Airbus has argued that Boeing receives illegal subsidies through military and research contracts and tax breaks. In July 2004 former Boeing CEO Harry Stonecipher accused Airbus of abusing a 1992 bilateral EU-US agreement providing for disciplines for large civil aircraft support from governments. Airbus is given reimbursable launch investment (RLI), called "launch aid" by the US, from European governments with the money being paid back with interest plus indefinite royalties, but only if the aircraft is a commercial success. Airbus contends that this system is fully compliant with the 1992 agreement and WTO rules. The agreement allows up to 33 per cent of the program cost to be met through government loans which are to be fully repaid within 17 years with interest and royalties. These loans are held at a minimum interest rate equal to the cost of government borrowing plus 0.25%, which would be below market rates available to Airbus without government support. Airbus claimed that since the signature of the EU-U.S. Agreement in 1992, it has repaid European governments more than U.S. $6.7 billion and that this is 40% more than it has received. Airbus argued that the pork barrel military contracts awarded to Boeing, the second largest U.S. defense contractor, are in effect a form of subsidy, such as the controversy surrounding the Boeing KC-767 military contracting arrangements. Airbus further claimed The significant U.S. government support of technology development via NASA also provides significant support to Boeing, as do the large tax breaks offered to Boeing, which some people claim are in violation of the 1992 agreement and WTO rules. In its recent products such as the 787, Boeing has also been offered direct financial support from local and state governments. In August 2010, the WTO ruled that the European Union's funding to Airbus through the use of loans with below market rates, and research grants and infrastructure runway funding initiatives were illegal. 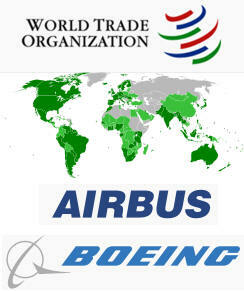 France's transport and environment ministers have reported on Wednesday (September 15, 2010) that a non-public preliminary report by the World Trade Organization (WTO) states that Boeing aircraft company violated international rules by receiving billions in federal subsidies. This report comes after a recent decision by the WTO Airbus gained an unfair advantage through billions worth of low-interest government loans, infrastructure provisions, and research and development grants. "If today's reports are accurate that some $3 billion of the EU's claims were upheld by the WTO, excluding the claims that relate to past programs long ago remedied by Congress, then the ruling amounts to a massive rejection of the EU case and confirms that European launch aid to Airbus stands as the single largest and most flagrant illegal subsidy in the aerospace industry. "Nothing in today's public reports on the European case against the U.S. even begins to compare to the $20 billion in illegal subsidies that the WTO found last June that Airbus/EADS has received (comprised of $15 billion in launch aid, $2.2 billion in equity infusions, $1.7 billion in infrastructure, and roughly $1.5 billion in targeted research support). "Nor are there seemingly any violations requiring remedy approaching the scale of remedy required of Airbus/EADS as a result of the WTO's June ruling that European governments must withdraw and remedy the $4 billion in still outstanding illegal launch aid subsidies that Airbus/EADS received for the development of its A380. Billions must be repaid or restructured on proven commercial terms. And, equally, they must remedy the adverse effects of the other $16 billion in illegal subsidies, too. "Neither do the public reports suggest that Boeing's traditional market based approach to financing new aircraft development will need to change; a distinct contrast to the requirement that Airbus/EADS abandon its plans for financing development of new models such as the A350 through launch aid subsidies. "Given the shape of today's opinion, as it has been reported, the WTO findings against the US are likely to require few changes in U.S. policies and practices. One of the two principal matters that the WTO is reported to have cited as inconsistent with its rules was long ago remedied by the Congress: general US export tax policy embodied in FSC/ETI. That was litigated at the WTO and remedied last decade. As to the second principal matter ? NASA research ? we are heartened to read that, contrary to statements earlier today from European sources, three-quarters of the subsidies at issue were found to be wholly compliant with WTO rules. "Today's ruling underscores our confidence in the WTO processes and dispute-resolution procedures. We applaud the body for its work and continue to look to Airbus/EADS and the EU to recognize that in today's global market, it is essential that everyone play by the rules and abide by the WTO requirements. Playing by the rules, for Airbus/EADS, means withdrawing their still-outstanding A380 prohibited launch aid subsidy and financing the A350 on commercial terms."